"41RR7, A513396" by Timothy K. Perttula and Robert Z. Selden Jr. 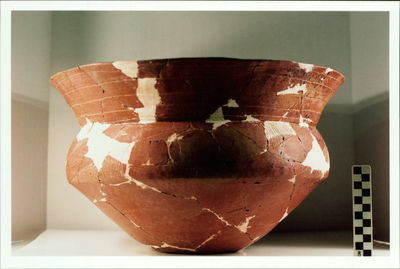 The one vessel from the Wright Plantation site is a large shell-tempered and red-slipped Avery Engraved compound bowl. Such vessels are present in McCurtain phase contexts in this stretch of the Red River, most likely from post-A.D. 1500 contexts. Site records on the Texas Historic Sites Atlas indicate that a Hudson Engraved vessel, also dating to late McCurtain phase times, came from the “low sandy mound” along with a turquoise pendant. Avery Engraved compound bowl from the Wright Plantation site (A513396).